In the early '90s, in the Irish village of Ardrahan, 16 miles from bustling Galway city, David and Martin Howley were put to bed each night with a mix tape of music. The tape's tunes are not your usual lullaby. They run the gamut from Irish traditional to American bluegrass, from the Chieftains to Bob Dylan. "We were very lucky," says David Howley, now a musician in the renowned band We Banjo 3, which alights in Tucson on Valentine's Day. "Our dad had a powerful interest in American music. He would make the mix tapes. He was cross-pollinating our music." The efforts of Howley Sr., himself a "great singer and guitar player," had a lifelong effect on his sons. The two Howley brothers are still cross-pollinating. 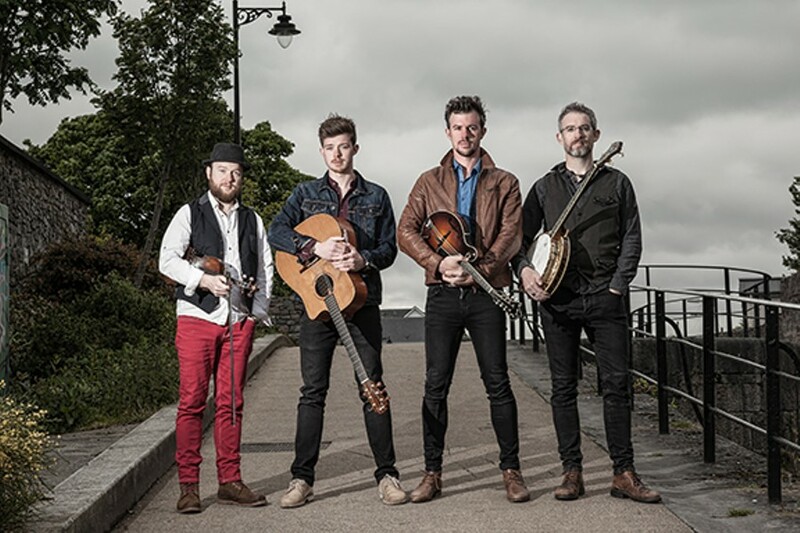 They're one-half of an eclectic, globe-trotting band that plays "Celtgrass," a sound that is as much about the haunting melodies of Ireland as it is about the jaunty strains of American bluegrass. "The driving energy is Irish," David says. "But the pyrotechnics come from bluegrass." We Banjo 3's two other band members, Enda and Fergal Scahill, are also brothers, coincidentally, and they grew up in a village 30 minutes from the Howleys. But from childhood they were steeped in deeply traditional Irish music. "We've known each other for 18 years," David says. "We used to see Fergal and Enda play sessions," at traditional music gatherings. The Scahill brothers, a decade older than the Howleys, performed traditional Irish for years, but seven years ago the four joined forces. The two Howleys and one Scahill—Enda—play the band's three titular banjos, and all three perform on mandolin. David is also a guitarist. The lone non-banjo-ist, Fergal Scahill, reigns on a host of instruments, from fiddle to the viola. All four brothers sing, with David taking the lead at vocals. Nowadays, We Banjo 3 tours internationally, even playing for then-President Barack Obama at the 2016 Friends of Ireland luncheon in Washington. They've racked up numerous awards and put out four CDs that celebrate rhythms both bouncy and raucous. "We highly recommend dancing at the concert," David says. "We do enough sitting down in life. We're all meant to dance and clap." 7:30 p.m., Wednesday, Feb. 14, at Berger Performing Arts Center, 1200 E. Speedway. Tickets $25 adults; $23 students, seniors 60 and up, and members of Tucson Friends of Traditional Music. Tickets available at inconcerttucson.com. ; Antigone Books, 411 N. Fourth Ave., 792-3715; and The Folk Shop, 2525 N. Campbell, 881-7147. The joyful We Banjo 3 show is not the first event in this year's Irish season. Arizona Theatre Company got there in late January with Outside Mullingar. Written by John Patrick Shanley, famed for Doubt and Moonstruck, this endearing play zeroes in on the Irish passion for the land—and the disputes that can arise over it, even within families. But it's primarily a sharp and funny love story, between the unmarried, middle-aged son and daughter of two neighboring farms. The play closes this Saturday, Feb. 10; remaining performances are at 2 and 7:30 p.m. on Thursday, 7:30 p.m. Friday, and 2 and 8 p.m. Saturday. Tickets $41 to $63, online, at arizonatheatre.org, or at the box office at Temple of Music and Art, 330 S. Scott Ave. 622-2823. Upstairs at the Temple Gallery, two local aficionados of Ireland are exhibiting 27 of their color photos of the Auld Sod. Bit Devine, who runs tours to Ireland, and Flano Flanagan, who operates Flanagan's Celtic Corner store, have roamed widely across Eire, taking pics of castles and countrysides from Dublin to Doolin, ground zero for trad music. Through February; open 10 a.m. to 4 p.m., Tuesday through Friday; and 90 minutes before performances. Closed Monday. Closed Saturday and Sunday except on weekend performance days, when it's open noon to 4 p.m. and before the show. Best to call in advance, 622-2823. Free. The Chieftains—55th Anniversary Tour unrolls at the Fox Tucson Theatre on Feb. 28. The grand old Irish band, founded in Dublin in 1962, gets credit for bringing old-time Irish music to world stages; the musicians have gigged with everyone from Sinéad O'Connor to Mick Jagger. Three original members, Paddy Moloney on Irish pipes and whistles, Kevin Conneff on bodhrán Irish drum and Matt Molloy on Irish flute, are still cranking out the tunes. The instrumental band will be joined by a harpist, the young fiddler Tara Breen and dancers Cara Butler, Jon Pilatzke and Nathan Pilatzke of Riverdance. 7:30 p.m., Wednesday, Feb. 28, at the Fox Tucson Theatre, 17 W. Congress St. Tickets $32 to $89, available for no fee at the box office, open 11 a.m. to 6 p.m., Tuesday through Friday, and two hours before shows. Available via phone, 547-3040, or online at www.foxtucson.com for a hefty fee. Old Blind Dogs is a Scottish band, not Irish, but we'll include them here in honor of pan-Celtic harmony. The four-musician group is known for its superb vocals, led by singer Aaron Jones. Their Tucson concert on March 3 marks the welcome return of virtuoso fiddler Jonny Hardie, who weathered a six-year immigration ban imposed by those fine folks at Deptartment of Homeland Security (motto: Keeping America Safe from Jigs and Reels). Also on board are Ali Hutton on bagpipes, flutes and whistles, and Donald Hay on drums. 8 p.m., Saturday, March 3, Berger Performing Arts Center, 200 E. Speedway. Tickets $25 adults; $23 students, seniors 60 and up, and members of Tucson Friends of Traditional Music. Tickets at inconcerttucson.com. ; Antigone Books, 411 N. Fourth Ave., 792-3715; and The Folk Shop, 2525 N. Campbell, 881-7147. The big day itself, March 17, conveniently falls on a Saturday this year. St. Patrick's Day parade starts at 11 a.m. at 17th Street and Stone Avenue, goes north to Ochoa, hooks a right onto Scott, and then East to Sixth Avenue, and south to its endpoint at Amory Park, at 13th Street and Sixth Avenue. The festival officially starts at 10 a.m., but the music and dancing starts cranking at noon, courtesy of a variety of Irish-oriented artists. Trinkets, food and beer are all on the menu. The Celtic craic (Irish for "good times'") rolls on until 5 p.m. Check out local bars for Irish music playing on into the wee hours.